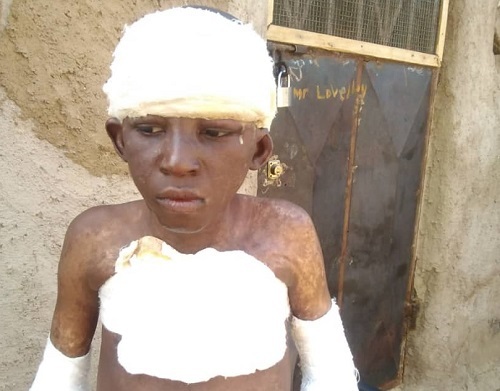 An 11-year-old boy, Ayinbisa Maxwell, who was set ablaze by a 28-year-old man for peeping at a woman in a bathroom, is battling for his life, with the suspect freely walking about a year after the incident. Parents of the victim reached a settlement with the perpetrator, John Nsobilla, who agreed to pay for the hospital expenses. The police were unable to proceed with the case against the suspect. Even though the police say they are still interested in the case, the parents and family members of the boy seem uninterested. According to the Bolgatanga Municipal Police Commander, Mr. Samuel Punobyin, the boy’s family did not want the case to go to court because they had agreed with the perpetrator to settle all the hospital bills. As a result, the perpetrator, who was charged for causing harm, was granted bail and the case halted. A year and two months after Ayinbisa Maxwell had survived the burning, his health condition has rather been deteriorating. His wounds are not healing as expected; rather, the burnt portions of his body are rotting while other parts of the body are wrinkling and producing blisters as a result of poor management of the wounds, giving his body a bad odour. His father, Abdul-Rahaman Mustapha, has indicated in a media interview that it has not been easy for the family since the incident happened, with the cost of treatment posing a big challenge to them. He added that the perpetrator who had earlier been settling the bills has now stopped, thereby leading to the deterioration of his condition. On 24 November, 2014, at Damweo, a suburb of Bolgatanga Municipality, the victim and his two friends were sent by someone to buy petrol with a gallon. They bought the petrol and on their way back, according to the boy, his friends veered off their course while he stood waiting for them to return. While waiting, Nsobilla ran towards him and held him, claiming that he (the victim) was among the boys peeping at the naked woman in a nearby bathroom. The victim said the Nsobilla collected the gallon of petrol from him, poured it over his body, set him ablaze and left him to his fate. It took some eyewitnesses to save the boy. Nsobilla was forced to take the boy to hospital for treatment which he did. Meanwhile, DAILY GUIDE has learnt the boy has not been consistent in terms of treating his wounds hence the deterioration of his condition.